Commercial Heating & Air Conditioning Contractor | Clarksburg & Bridgeport, WV | Climatrol Inc.
Climatrol engineers designs and installs heating, AC, cooling, and air quality systems for our commercial clients in Bridgeport, Clarksburg, and throughout our West Virginia service area. 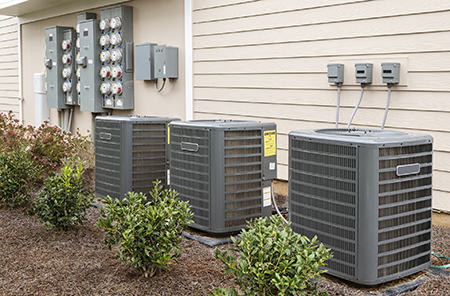 We also design energy-efficient retrofits, perform routine maintenance, and offer comprehensive repair service for all makes and models of commercial climate control systems. A well-designed and maintained heating and cooling system is a critical component of keeping your employees comfortable and productive, and your work equipment safe from the effects of cold, heat, and excessively humid conditions that may create serious issues. The employees of Climatrol have the skills to promptly diagnose problems with your climate control system and make recommendations to correct the problem in the most cost-effective manner. Our business was founded on the premise of honesty and integrity. If you system requires replacement, you can rest assured that we will provide you with a fair price for installation of one of the finest and most reliable replacement heating and/or AC systems available. Does My Boiler, Furnace, or Central AC Need Repair or Replacement? If your commercial furnace, boiler, or central air conditioning unit seems to be working much harder than normal, is providing less or inadequate conditioned air, is making unusual noises, or otherwise appears to be failing to function properly and you are wondering if you should have your climate control system checked, repaired, or replaced, contact us right away. Repairs are typically less involved and less costly when they are detected early. We are proud to be one of the region’s most trusted HVAC contractors, with thousands of satisfied customers throughout the region. We offer free quotes for all of our commercial services. Contact the professionals at Climatrol to request a quote or schedule a consultation to discuss your commercial repair or installation project. Call: (304) 623-0606.